Due to a lack of fossilized remains, controversy exists concerning when, where, and how language developed. Implicit in this discussion is the notion that language is spoken. But it is a pretty safe bet that (based on current observations of animals) inter-species communication is not dependent on the development of language. Was their an antecedent system for human communication before the development of language? Did language provide a survival advantage during the Ice Ages? Did Lucy Use Sign Language? A favorite hypothesis of modern linguistics is that sign language served as antecedent to modern language. From this perspective, when early ape-men roamed the earth, the increasing adoption of a bipedal posture allowed our ancestors to communicate by sign language. Indeed, in the modern world chimpanzees have a well-developed system for sign language communication. But, how far back in time does sign language go? Lucy’s remains were found in Ethiopia in 1974 by Donald Johanson and Tom Gray. Lucy, who lived 2.8 to 3.8 million years ago, was a member of the Australopithecus afarensis “tribe” of hominoids. By Lucy’s time man had already branched off from the apes. Lucy was thought to be bipedal and to have physical features similar to both chimpanzees and man. So, Lucy certainly had the capability to communicate via sign language, even if she was born long before the “invention” of language (50-100 thousand years ago). However, there is no current evidence to suggest that Lucy ever signed. So is this a case of the absence of evidence being evidence of absence? Hold that thought. After a million years or so, Lucy’s progeny produced the hominoid Homo erectus. It was the Homo erectus who tamed fire and invented language. Homo erectus’ progeny would give rise to a number of hominoid species, including Neanderthals, Cro–Magnons, and Homo sapiens (which would be us). It seems as if Homo erectus’ progeny came to dominate the earth the same way many species of dinosaurs dominated the earth 65 million years ago. Then came the Ice Age (actually there were five distinct Ice Ages). Of all of Homo erectus’ progeny, only one species survived until modern times: Man. Why did Man alone survive the Ice Ages? Perhaps it was because Man developed language and the other hominoids did not. Language would have allowed for communal efforts to cope with the cold. But if this was the case, how did the Chimpanzees and other apes survive the Ice Ages? While Chimpanzees and other Great Apes make noises, linguists do not consider these creatures to have any form of language as we know it. Then again, the Chimpanzees could use sign language to organize communal action. Just because chimpanzees did not pass on sign language to Lucy and other Australopithecus afarensis does not mean they didn’t utilize it themselves. Yet, the take home lesson here is that language-based communal action may have allowed Man (through the use of language) and the Great Apes (through the use of sign language) to independently pass through the Ice Ages. Do you require sign language or other interpreting services? Contact Legal Language today to learn about our professional interpretation services. Request an interpretation quote today! How Much Do Lawyers Really Know About Language? Can You Contract Your Way Out of Hague Convention Service? Did the Volkswagen Litigation Hit a (Small) Speed Bump? Friendly edit . 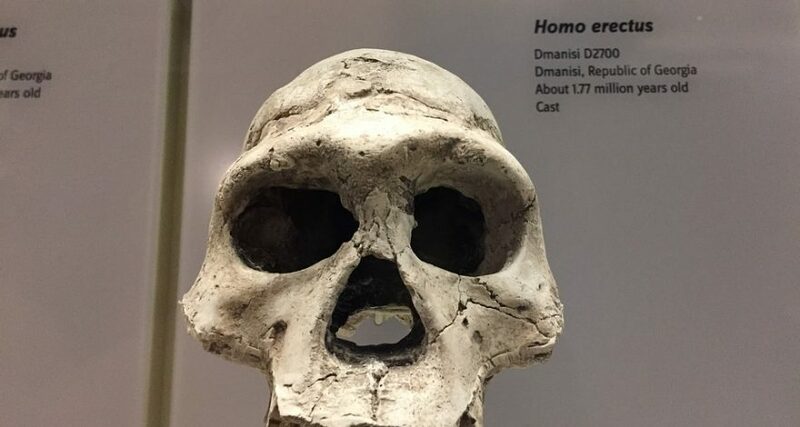 . .
Homo erectus’ progeny would give rise to a number of hominoid species, including Neanderthals, Cro–Magnons, and Homo sapiens (which would be us). Homo erectus’ progeny would give rise to a number of hominoid species, including Neanderthals, Cro–Magnons, and Homo sapiens (which would be we).